While we did not really feel a strong urge to have some champagne after the numerous champagnes tasted earlier in the week at Terres et Vins de Champagne, we were having guests on Saturday and it was sort of a given that a bottle of something would be opened. As we were having asparagus it was also clear that we would be having something that was not overly fruit driven and we were considering some of the lovely Rieslings. However, after some deliberation we opted for champagne instead as we felt it would also work well together with the asparagus as well as function as an aperitif. The choice fell on the Varnier-Fannière Grand Cru Brut Zero NV that we had brought back from our trip to London. The family Fannière settled in the Côte des Blancs as early as 1860, but at that time and until the 1950s they sold off all their grapes to other producers. In the 1950s Jean Fanniere started to bottle Champagne under his name and then his son in law, Guy Varnier, succeeded him and took over production. Today the son of Guy, Denis Varnier, is in charge of the company and has taken over the still family owned and run company. They have a fairly small estate, only 4 hectares but all in the Grand Cru villages of Avize, Cramant, Oger and Oiry. The entire estate is old vines which is in line with the estate policy of conservation. The average age is around 40 years old as they believe strongly that the old vines will produce better champagne and if this Brut Zero should be taken as the result of this then I am inclined to agree. On intra-European flights my hopes of having any decent wine is usually very slim, especially these days when even traditional airlines are scaling back on service. I seldom drink at all on flights, mainly due to the low quality of what is offered but also due to usually being on the way to something where I do not want to have had any alcohol before. This time I was however intent on at least sampling the wine and even if it may perhaps not be that good I am willing to so to say take one for the team (the team being you readers) to write this short piece about it. I was flying Scandinavian Airlines (SAS) and they had an offering of 4 different wines (on an intra-european flight). Two reds, one white and one sparkling. We sampled two of the wines but in this segment we will focus on the sparkling one. SAS replaced the champagne a few years ago and now offer a traditional method sparkling wine from Luxembourg the Bernard-Massard Cuvée de l’Ecusson Brut. I have seen this bottle several times before both in the stores in Sweden and Finland as well as in some duty free shops but never tried it. The idea was to produce high quality sparkling wine in Luxembourg, and by making use of the recently established customs union between Belgium and Luxembourg sell the wines to both markets. His partners were well connected in Belgium, thus helped them to establish a strong presence there and it has since the start been the biggest market for the company. The Grevenmacher winery was built on the Moselle river. The company also established a German subsidiary, ‘Sektkellerei J.Bernard-Massard’, with a winery in Trier so it possible to see the Bernard-Massard name on those bottles as well. After Jean Bernard-Massard passed away the Clasen family took over the management and they are still running it and the company remains a family managed business producing around 4 million bottles a year. The Bernard-Massard Cuvée de l’Ecusson Brut is made of a blend of 40% Chardonnay, 15% Pinot Noir, 35% Pinot Blanc and 10% Riesling. It is perhaps not the most common blend but all well-known grapes. This is, if I understand it accurately, their mid-range cuvee, the Millésimé being the premium one, and it was created in 1971 to commemorate the 50th anniversary of the company. Opening the bottle, the first thing that hits me is that it is a screw cap. Can understand it as it is for a flight but gives a cheap feel to it. The wine is pale yellow in color but with fine persistent bubbles. The aroma had notes of sweet citrus, yellow apple and pear. The palate had a clear sweetness to it that I did at least find a bit disturbing as it took over the apple and pear that is there as well. For me this is not a favorite as it was too sweet. The fact that it is a brut surprised me so when reading up it actually has 11.5 (!) grams of residual sugar so in many markets this would not be a brut. Quality does not fully impress, so I would give it a 2.5 rating. I could however see that this would appeal to people who appreciate a bit sweeter wine, yet not super sweet, sparkling wines and it is not at all a bad, so if you have another taste preference than me you may very well appreciate this one a lot. It is available at Alko in Finland for €13.90 and at Systembolaget in Sweden for 127 SEK(approximately €13-14) and at that price I would give it a value for money rating of 2.5 as well. There are better value sparkling wines than this at around or below this price but I do feel the need to once again stress that if you have a taste profile leaning a bit more towards the sweeter wines (and that is then more compared to the dry brut nature or zero dosage wines) you may very well find Bernard-Massard good and then the value for money rating would of course also be higher. I am a bit surprised that SAS would opt for such a relatively sweet wine as the only option for sparkling wine on their European flights. I guess it comes down to cost and this may be something that they have been able to buy relatively cheap and I have also understood that their are some other airlines serving this (Finnair have at least done so). I do hope that SAS has some better wine on their intercontinental flights and I will report back on that after some of my upcoming flights with SAS to Asia. I will not repeat the story on Kloof Street and Mullineux as I have written more about it in a previous review of the Kloof Street Swartland Rouge, read it here. What can be said about this Chenin Blanc is that it is not your run of the mill entry level wine. The vines used for this are over 40 years old so this is actually really interesting wine for this price level. The Kloof Street Chenin Blanc is reminiscent of a Loire Chenin Blanc, or at least that was part of how it was described to me by the knowledgeable sommelier at Monvinic where I sampled it, and I can see what they mean. It is pale straw yellow in color but the nose was a bit strange to me, it had notes of ripe pear and apricot but also a bit of wet granite. There was however a scent that somehow was a bit stale about it, and at first I thought something was off about the wine. With some air it did however disappear but I was almost on the verge of checking with the sommelier if it corked. The wine is fresh and clean on the palate with dry pineapple and mineral but combined with a nice creaminess. Despite my initial hesitation the wine won me over when it had some air. It rates as a 3.5 for quality and price wise it will set you back between €13-17 and that is decent value for money so also there a 3.5 rating. Pleasant, drinkable and would consider having it again. We are always on the lookout for wine makers that use organic/ecological methods when producing. many of the producers we work with and/or have visited largely follow what is required to be organic but they are not willing to spend the time and money to be certified (the certification can include several audits a year and certification fees). We did however recently encounter an interesting cava that is marketed as organic. The cava is called VallDolina and is made by producer Celler-Masia Can Tutusaus. The winery was started in 1987 by Joan Badell Badell, who decided to bottle his first wines and to plant his first trained vines. It was not until 1999 when Raimon Badell Rosés, the son of the founder, who was then studying oenology and already involved in the winemaking process, turned the focus to ecological and biodynamical production. Since then, in 2006, oenologist Ferran Gil García has also joined the team. The winery has 10 hectares where they currently produce one white wine, one rosé wine, three red wines and three different types of cava. the entire production is done with grapes from their own estate. The vineyards are boardering the natural park at the Massif of Garraf, with an altitude of between 240m and 360m and have limestone and reddish clay soil and produce, on average, 3500l/h. The climate is Mediterranean, strongly influenced by the vicinity of the sea. The winery produces only around 20 000 bottles a year and the small scale also mean that they just like for example Rimarts still can make the disgorging manually, without freezing the sediment. I am not knowledgable enough to know whether it produces a superior cava but I know it is cool to look at the manual process so if you ever get the chance to see that it is great fun. The specific cava that we now tried was the Brut Nature Reserva. It has made with traditional cava trio of grapes (Macabeo, Xarel-lo and Parellada) but also a touch of Chardonnay. It has been aged for 24 months. I must also inform you that I tried this side by side with a champagne (Pierre Gimonet, 2008 Non Dosage) so some of the impressions may be influenced by that comparision. I have tried to give it a fair rating so have hopefully managed to remove any comparison. The VallDolina Brut Nature is very pale yellow in color. The nose is very fresh with some citrus, mineral and earthy aromas. As it is Brut Nature (no sugar added) it is very dry, nice acidity and a touch of citrus. To me it lacks some complexity and I would have liked a bit fuller flavor. As it is, the cava is pleasant enough as an appetizer but it lacks the complexity to be paired well with foods. It is however still good enough for me to be interested to sample their other wines and especially the Gran Reserva. Pure quality rating I would give it a 3, value for money is a 3.5 as I had it for €7 a glass at a wine bar in Helsinki which is a pretty good bargain. If I however look at the price at Alko (the Finnish Monopoly) it is almost €110 for a case of 6 (not sold by the bottle) and that is not good value for money (more like a 2). Looking at the price level in Spain and elsewhere in Europe it is however possible to find it at better prices and I would not doubt trying it again as it is a pleasant enought cava and compared to most other organic ones I sampled this is one of the better, so I recomed trying it as an example that it is possible to produce good organic cava. Continuing on the Portugal theme but this time not connected to my recent trip there but still about Portuguese wine. 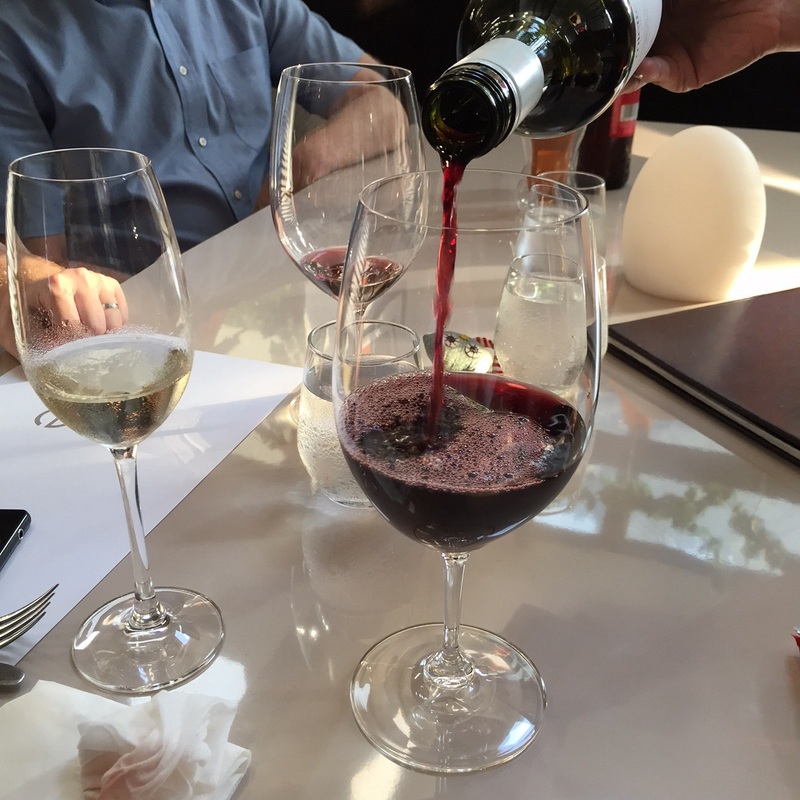 I visited one of my favorite wine bars, not only in Barcelona but in the world, Monvinic. They always have an interesting selection of wines as it rotates as soon as a bottle is finished. In Spain it is not common to find Portuguese wine so I was glad to find this one from Quinta do Perdigao. The vineyard was planted in 1997 at an altitude of 365 meters, in the area around Viseu and covers 7 hectares. The soil is granite based and the vine density is close to 5 000 per acre, they mainly have Touriga Nacional, Tinta Roriz, Jaen, and Alfrocheiro as well as some Encruzado. Production is largely done sustainably and pesticidies are avoided. Not sure if they are organically certified as I have heard differing stories, but they are trying to produce in a sustianble and ecological manner. It is a small family winery so no huge volumes produced here so perhaps something for my list to visit next time around. The wine I sampled was the Quinta do Perdigão Colheita from 2009. It has 20% Touriga-Nacional, 35% Tinta-Roriz (Tempranillo) 35% Jaen (Tinta Mencia) and 10% Alfrocheiro. I am not that familiar with Alfrocheiro. Wines made from it are often rich in colour with firm but ripe tannins and a good balance of alcohol, tannins and acidity. Flavor is often ripe with berry fruit, particularly oblackberries and ripe stawberries. They are somehwat prone to attack by oidium and botrytis and require a lot of attention. Origin is somewhat debated as it originally was thought to be related to Pinot Noir but now the consensus appears to be that it is an indigenous Portugese variety. This specific wine only has 10% of Alfrocheiro but I will try to seek out some wines where it is more dominant. The wine has been aged in French oak barrels (225 litres) for 12 months. The color was deep ruby red. The nose has a nice touch of red fruits and herbs. The Aromas include a touch of smoke, dried and fresh herbs, and savory fruits. The wine has a nice acidity but with some tannins. There are clear falvors of red and dark fruit. For the price range I think it is a good wine (available for around €8-10 in many places), the quality is not exceptional but still good so rating it a 3 for quality and a 3.5 for value for money. Quartz Reef is a winery in the Central Otago part of New Zealand. The slightly odd name is taken from the largest Quartz rock deposit in New Zealand that lies below the winery. As many Otago wineries they are strong with Pinot Noir but in this instance I sampled their Brut Sparkling wine. The winery was formed in 1996 by Rudi Bauer an experienced winemaker who has worked in Germany, Oregon and Champagne. He was also one of the people behind creating the Central Otago Pinot Noir celebration and he has multiple Pinot Noir wines available. I must try to sample some of those as well in the future. The winery has around 30 hectares near Cromwell in Central Otago. In addition to several clones of Pinot Noir they also have Pinot Gris and Chardonnay. Back to sparkling wine though. Rudi was one of the pioneers of sparkling wine production in New Zealand. He made his fist attempts with sparkling wine in New Zealand in 1990 and before that he had spent time in Champagne with Champagne-maker Clotilde Chauvet and Jacques Peters of Veuve Clicquot to master the process. I am not sure if that is where he learned all of his skills but I was impressed by his wines. The fact that more than 70% of the total production for them is sparkling wine suggests that consumers also like it. The one I sampled was the Quartz Reef NV Brut Method Traditionelle. It is blend of 58% Pinot Noir and 42% Chardonnay, it has been aged for 24 months and has 8g of residual sugar per litre. The wine has a nice nose of lime, melon, brioche, lees and fresh green apples. It is refreshingly dry with clear acidity, pleasant if that is your thing. There are clear notes of citrus and the finish is full of mineral and chalk. A very good wine that I would not hesitate to have again. It makes me want to sample the rose as well as the vintage sparklings. It is in between a 3.5 and a 4 in quality rating but being generous I give it a 4. I had a glass at the excellent wine bar Monvinic in Barcelona and there a bottle was a bit more than €50 and a half glass was €6.5. From the producer it is possible to buy it for 30 New Zealand Dollars which is about €21 and that would be really great value for money. In Europe it is likely to set you back a bit more (if you can find it) but I have seen it available for around €25 from Winedirect in the UK and that is great value for money. Very good value for money at €25 so a 4 for that. The exploration of wines we would never have tried if we were at home has continued in Singapore. 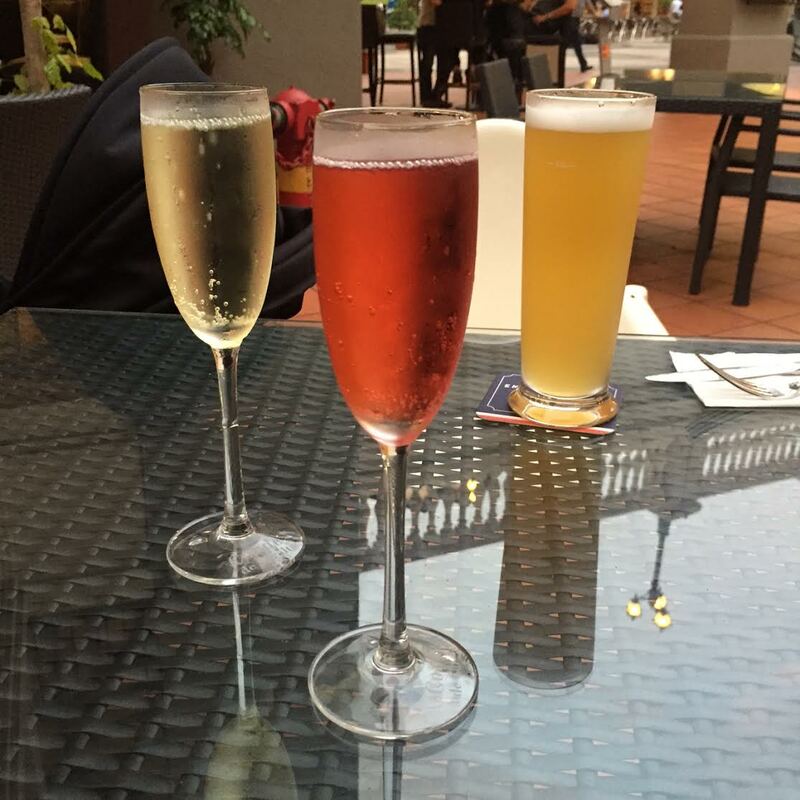 We found ourselves at Robertson Quay and thought that we would have some luck finding good wine (and we did, review of wine bar Verre to come) as there was a Wine Connection bar and store there. Unfortunately their selection continues to disappoint, especially from a value for money perspective so we ended up going to a very touristy tapas bar around the corner from Wine Connection. The food was utterly disappointing but the cava was a surprisingly decent for the price. They were charging 7 SGD (so roughly €5) a glass both for the rosé cava and the regular brut. The cava was Conde de Caralt Brut and Conde de Caralt Rosado. I had never heard of either before so really had no expectations. The cava house at one time used to be independent but is nowadays part of the behemoth producer Freixenet. Before that it was founded in 1964 by José Maria de Caralt. I am normally expecting poor quality and value for money from the major producers so I was glad I did not know who owned it before I tried the cava as it may perhaps have clouded my judgment. The Brut had a light golden color and an abundance of bubbles, a bit “too sparkling” for my taste but the bubbles are small and pleasant. The nose of the cava is very discreet but there are hints of lemon, mild peach, apples and grass. The cava is very easy to drink and refreshing. It has a pleasant mouthfeel with notes of fresh lemon, crisp green apples mixed with a hint of acidity and a finish of some light sweetness. Not a complex cava but enjoyable enough when it is over 30 (C) and humid and at this price it is actually unbelievable value for money. In Singapore one normally pays at least 10 SGD plus VAT and service charge (and most of the time a lot more) for the simplest Prosecco (and more for cava or any other sparkling wine). While I would not actively search this out I would feel fine ordering it again. It is available for around €6-8 per bottle in many countries (in Spain as low as around €4) and for that it deserves a 4 in value for money rating. Quality is deserving of 2.5. The Rosado was a bit more red than I would have expected, looking strawberry like in color. The nose was full of berries and fruit. Clear notes of both strawberries and raspberries as well as cherry. The flavor is not as berrylike as the nose would lead one to believe but it has a pleasant mix of berry flavors, both strawberry and raspberry, and a light touch of cherry. Despite being cheap it avoids the cheap taste that some rosé and sparking rosés can have. Mainly due to the lack of sweetness and alcohol in the flavor so not at all a bad wine at this price. Quality wise I would rate it as a 2 but I have seen it under €3 a bottle in Spain (and around €5-7 in other European countries) and that is just an amazing price so value for money is 4. While hanging at one of our new favorite spots, Verre, in Singapore we explored the wine list a bit and came across an interesting red from Barossa Valley in Australia. Miette Grenache, Shiraz and Mataro from 2010. This red wine is from the winery Spinifex in Barossa. They were established in 2001 so compared to many other wineries in Barossa they are still just getting started. The man behind the project is Peter Scheel, New Zealander who has spent considerable time working in France before establishing Spinifex. He runs this together with his wife Magali Gely. The influences of France can be seen in the selection of the grapes, so a lot of focus on Shiraz, Grenache and Mataro (for those not familiar with Mataro it is also called Mourvèdre or Monastrell). They do also use other traditional French or Mediterranean grape varities such as Cinsault, Carignan, Ugni Blanc, Grenache Gris. This specific wine has 100% Barossa valley fruit. It has been sourced from a variety of vineyards, the Mataro from one old (90 year old bush vine vineyard) in Koonunga Hill region of the valley and the other Mataro competent from the far south of the Barossa valley. The Shiraz part also from Koonunga Hill as well as the far west of Barossa valley. The Grenache part came from three different old vine (30, 50 and 90 years old) vineyards in the east and north. All wines are made in small open fermenters, using indigenous yeast, and are basket pressed. The 2010 Miette Grenache Shiraz Mataro has been matured in French oak. The color of this wine is deep red. The nose is a pleasant mix of red fruits (strawberries and raspberries), dark plums and spice. The flavor is full of red cherries, plum but also leather and tobacco notes mixed with hints of something herbal. The relatively high alcohol level (14.5%) is not at all apparent on the palate and it also relatively refreshing and avoiding the sweetness that may come with a lot of the high alcohol and fruit driven reds. We had this wine by the glass at Verre and since it was happy hour it was very decently priced at 18 SGD for two glasses (when not happy hour it is 18 for one glass). Prices for a full bottle in Australia appear to be around 22 AUD (approximately €15) and while it is difficult to get hold of in Europe it is sold in the Netherlands and Belgium for €17. I think this is a very pleasant wine and while I would not necessarily run out to snap up several bottles of it, I would happily have it again. So I give it a quality rating of 3.5. Price wise this makes this wine pretty decent value for money but for reds one can often find similar or better value with other wines so it is a solid 3 in rating for value for money. It is a nice and approachable wine to enjoy now and for the coming year or years but not anything for long term storage. Over Christmas we opened a bottle of Grande Cuvée that we had lying around. It was not for storing and we thought it could hold its own with the heavy Christmas food (and I wanted to drink it). I could see my mother being very uncomfortable when I told her what the bottle cost, but if anything, a Krug is worth sharing with the ones you love. The bottle has an elegant design and always comes in a nice box. I think it is actually a great wedding or (upscale) birthday gift. Even better if you promise to store it for the lucky boy/girl to make sure it is not accidentally consumed between 2-4am in the night at that after party where you are just going to open one more bottle. The color is golden with a persistent stream of bubbles promising a fresh and crisp “first bite”. The nose of the wine is of chocolate and nougat, and the taste toasty with honey and nuts. Not very fruity. This is a powerful and full Champagne with a lot of character. It’s unlike any other Champagne I have tasted, so I am not surprised that Krug has inspired so many wine enthusiasts around the world. Pure quality-wise the Krug Grande Cuvée gets a 4.5 rating and value for money is to my opinion a 3. When it comes to the price, I just think I can get something I personally like almost as much for a third or fourth of the price. Take for example the Charlemagne Vintage 2008 (review here), I am very fond of that one and it cost closer to 40€ rather than 125€. However, as always, taste is taste, and people find different things in each wine. I am and will continue to be very curious about Krugs vintages. It would be wonderful to taste a -96 or a -90. Perhaps someday I will.